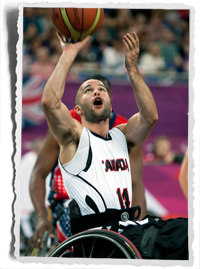 Senior national wheelchair basketball player Tyler Miller will be part of the stage performance at the 2015 Pan/Parapan American Games mascot launch July 17, 2013 at the Canadian Broadcasting Centre in Toronto, Ont. Miller is a bronze medalist from the last Parapan Am Games in 2011 in Guadalajara, MEX, and a Paralympic gold medalist from the 2012 Games in London, UK. The mascot will be unveiled in front of thousands of children during KIDS’ CBC DAYS at 2:15 p.m. Rose MacLennan, Olympic and Pan Am gold medalist for trampoline, will also be part of the performance. A meet and greet with the mascot and the general public will take place from 2:30 p.m. to 3:00 p.m. Interview opportunities with the mascot, athletes and TO2015 representatives will be available at 3:00 p.m. during the media reception.